Carrara White 2" Octagon Polished. 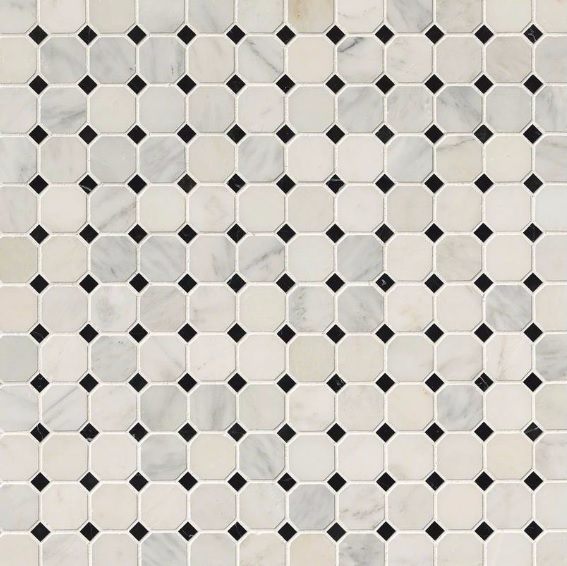 SOLD BY BOX OF 10 TILES / 10 SQ FT.
Backsplash tile in Carrara White 2" Octagon with Black accents is a dynamic Marble of whites with shades of gray and individual black accents. We recommended this kitchen backsplash tile for use in wall applications in both residential and commercial properties. Carrara White Marble - 2" x 2"
Black Marble Dot - 5/8" x 5/8"